Yarn Tails: Can You Say 'Ginormous'? It's done. Finally. I frogged this thing at least three times before I found a size and a design that worked for me. Isn't it gorgeous? Ok, maybe not. 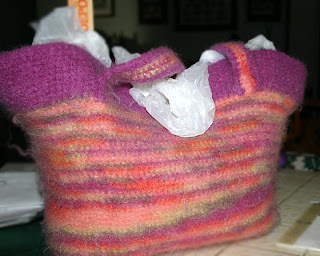 But it will be after it dries and I take the plastic bag stuffing out (I used every plastic grocery bag we had in the house - and we had a lot - to get this thing to hold its shape), add a decorative button and shave some of the fuzz from the outside. Finished measurements are about 11" high by 13" or so across the base. Just a slight change from the pre-felting dimensions - 32" across the top and about 19" top to bottom. And the best thing of all? 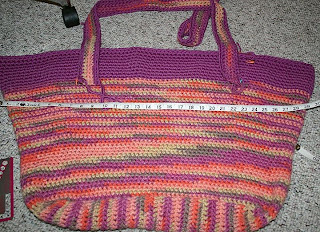 Since I couldn't find a bag pattern I liked, I put this one together myself. Stay tuned for another pattern, coming soon! 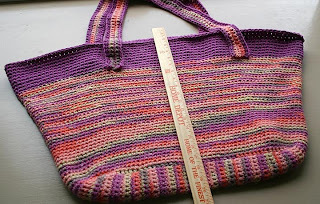 I love the colors you chose for this bag. They feel like Spring and very happy colors.